Goods / Freight Elevators ! A freight elevator is an elevator designed to carry heavy freights and goods at a quick pace, rather than passengers. (Passengers often accompany the freight, however.). Freight elevators are typically larger and capable of carrying heavier loads than a passenger elevator, generally from 5,000 to 10,000 lb (2,300 to 4,500 kg). Freight Elevators may have manually operated doors, and often have rugged interior finishes to prevent damage while loading and unloading. As compared to hydraulic elevators electric elevators are more energy efficient for freight lifting. These simple, flexible, durable, cost-effective and smooth riding Freight Elevators help solve the complex transportation requirements. Freight elevators are used extensively in places where bulk commodities/goods needed to transport vertically like factories, shopping centers and storage facilities for the movement of goods between floors. 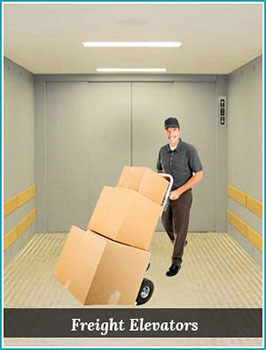 When planning freight elevator for a building, careful consideration needs to be given to the type of loading performed. 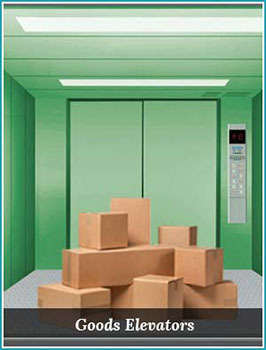 This lift is simpler in design and suited for low cost installations. The movement of the lift is based on the coiling and uncoiling of a wire rope on a rotating drum. This leads to lesser rope stress and longer life. These lifts are quicker to install and require lesser space. This lift is a better machine design wise and also offers greater safety to the user. This is achieved first through the use of 3 or more independent wire ropes stretched across the main traction sheave. Second, there being no positive coupling between the lift and the machine leads to greater safety as a slip is permitted whenever there is an obstruction to the lift travel. Unlike in the drum wound design there is no overload on the motor in case of lift overshooting at the top floor. Jerk free, smooth, higher speed travel is possible.